Tottenham's Juan Foyth scores their first goal. 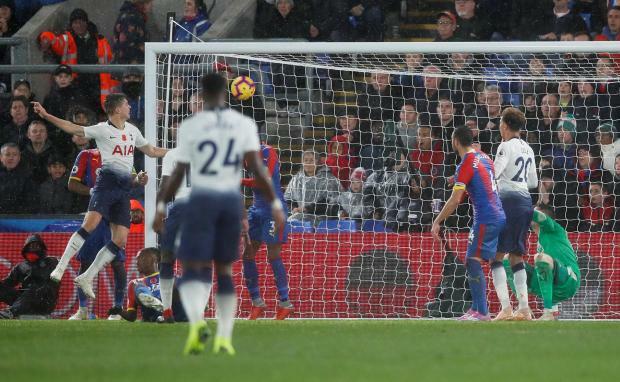 Juan Foyth banished the memory of his nightmare Premier League debut to score Tottenham Hotspur's only goal in a 1-0 win at Crystal Palace on Saturday. One week after the 20-year-old Argentine defender conceded two penalties in the 3-2 win over Wolverhampton Wanderers, he bravely headed home a rebound in the 66th minute as Spurs registered a seventh successive league win over Palace, who are suffering their worst home start to a season for 21 years. Spurs upped the tempo in the second half although they created few chances beyond Foyth's winner and suffered another injury when Erik Lamela left the field streaming with blood after being accidentally kicked in the face. The win moved Spurs level on points with Chelsea and Liverpool, who both play on Sunday, while only goal difference is keeping Palace out of the drop zone.